Boris Johnson suggests Prime Minister Theresa May could be locked up for her Brexit plan. The former foreign secretary told a fringe event at Conservative conference that May’s plan could cause her to be prosecuted under a 14th-century law. In fact, the law no longer applies in the UK. The comments led to comparisons on social media to the “lock her up” chants made about Hilary Clinton by Donald Trump supporters. BIRMINGHAM, ENGLAND – Theresa May could be prosecuted for her Chequers Brexit plan, the former Foreign Secretary Boris Johnson said today. 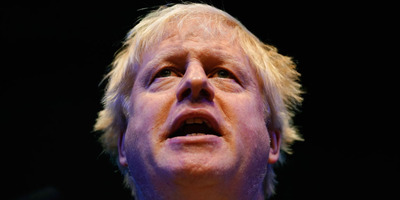 Speaking at a rally on the fringes of the Conservative conference, Johnson said May’s plan, which would leave the UK under EU regulations on the trade of goods, would risk her being prosecuted under an archaic 14th-century law. “It occurs to me that the authors of the Chequers proposal risk prosecution under the 14th-century statute of praemunire, which says that no foreign court or government shall have jurisdiction in this country,” Johnson said. The comments brought immediate comparisons on social media to the “lock her up” calls from Donald Trump’s supporters about former US presidential candidate Hilary Clinton. Under the law of Praemunire, those found guilty would lose their civil rights, forfeit their land or goods and even face imprisonment. However, the offence was removed from UK law under Criminal Law Act of 1967. Johnson described May’s policy as a “cheat” and suggested that voters would be right to feel betrayed by it. “If we cheat the electorate – and Chequers is a cheat – we will escalate the sense of mistrust,” he said. Johnson received a warm reception from the hundreds of Conservative members who packed into the auditorium for his speech. The bulk of his speech was devoted to Brexit. However, it also ranged widely across large areas of government policy from housing, to taxation to crime. The former foreign secretary said the Conservative party needed to regain it’s love of “freedom” and Johnson repeatedly said the party needed to let voterss “take back control” of their lives, in a reference to the sucessful Brexit campaign slogan. He stopped short of calling for May to resign, telling delegates that they should “back Theresa May” but try to force her to change direction on Brexit. However, he was accused by May’s allies of seeking to undermine the prime minister. The Scottish Secretary David Mundell told the BBC that people were now “concerned about Mr Johnson’s behaviour”. “Unfortunately Mr Johnson seems to behave in a way that suggests that he’s only focused on his own self-interests and not on the interests of our country,” he said. 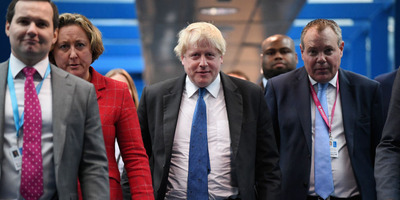 Allies of the prime minister have launched a series of attacks on Johnson over the course of the conference, with Lord Digby Jones labelling him an “irrelevance” and “offensive,” and the Chancellor Philip Hammond openly mocking him in multiple interviews.